What happened in Kansas City? P2PU Gathering Recap! P2PU Gathering started by introductions held, not surprisingly, in a very large circle. Two years following the initial pilot with Chicago Public Library in 2015, learning circles are now being run in 27 public library systems and community centers across the United States and Canada, as well as 13 branches of the Kenya National Library Service. In 2017, P2PU decided it was due time to invite all the learning circle practitioners and peer learning advocates together. 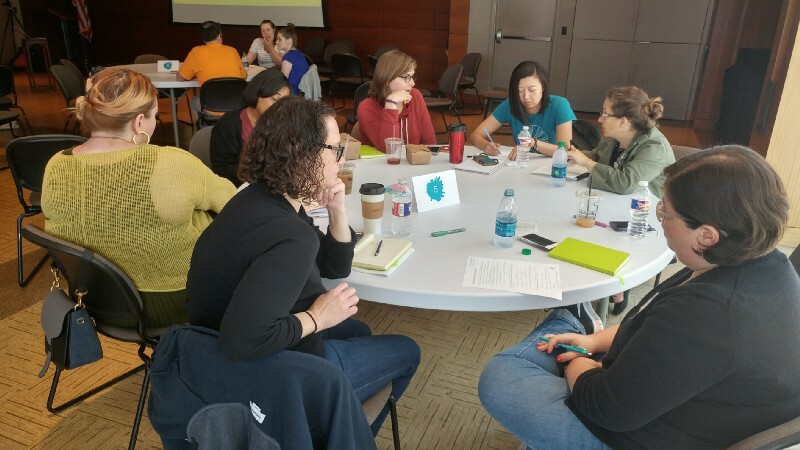 With the support of the Institute of Museum and Library Services, a P2PU ‘Gathering’ was planned to occur in the spring of 2018 hosted by the Kansas City Public Library in none other than Kansas City, Missouri, USA. Our Gathering would take place over two and half days starting on Wednesday, May 16th and ending Friday, May 18th. It was important for us to choose a date that worked for our guests, many of whom were traveling from far away. We wanted our guests to consider the event to be a working retreat and not something that took them away from personal and family time on the weekend. We were also very aware that traveling long distances can be messy and exhausting for everyone. With that in mind, we chose to include an optional pre-event evening meal for all guests and weary travelers. We also made sure our final day ended with lunch before guests left to the airport. “It was not a conference or a summit, but in itself it was a sort of large scale Learning Circle for Learning Circles”. That is a great way of putting it! We did, in fact, try to model and embed everything that we loved about learning circles in our Gathering. 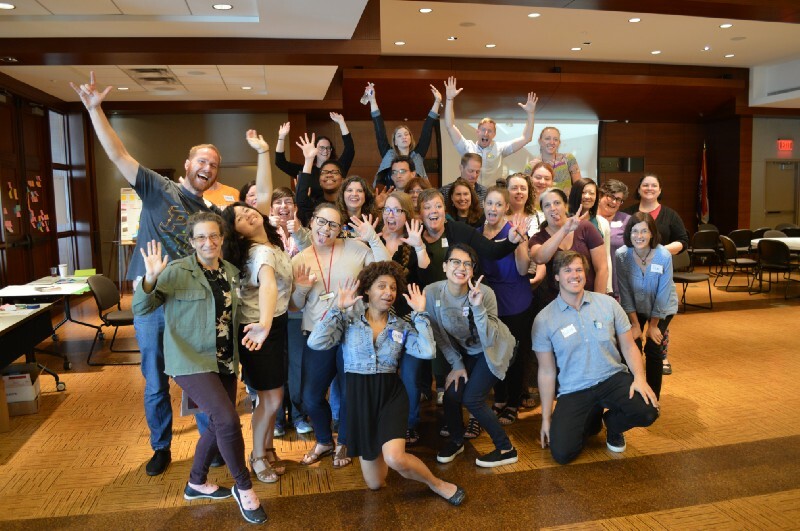 Participants joined from 16 public libraries (Boston, Pittsburg, Charlotte, Chicago, Cleveland, Detroit, Miami, Milledgeville, Philadelphia, Portland, Providence, San Jose, Tampa, Toronto, Wichita, and Kansas City, of course!) and 7 organizations and education institutions including Notre Dame Education Center, Partners Bridging the Digital Divide, the University of Arizona, and Google. Each guest brought with them a wide range of experiences and all were committed to the vision of P2PU and the learning circle model. 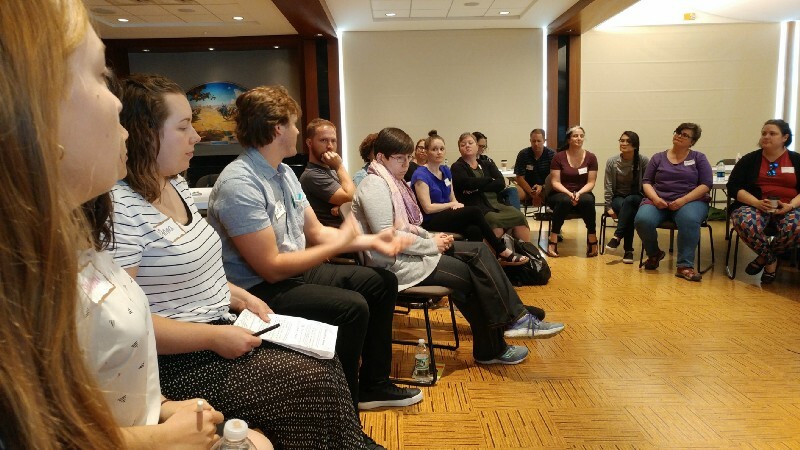 Some had personally facilitated five learning circles themselves, while others had no first-hand experience, but were eager to start in the coming months. Others, still, joined from an organizational level, offering their expertise and interest in partnerships, program management, funding and evaluation. 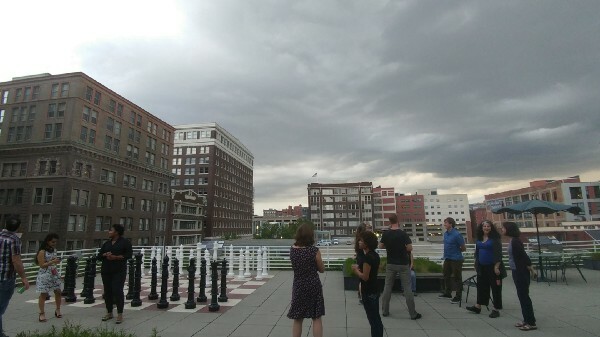 The Gathering started on Wednesday May 16th with an optional BBQ dinner on the rooftop of the main branch of the Kansas City Public Library. The meal was partly inspired by the Next Library conference which placed a special emphasis on social meals for the guests. The program officially began on Thursday, May 17th with all participants sitting in a large circle to introduce themselves. 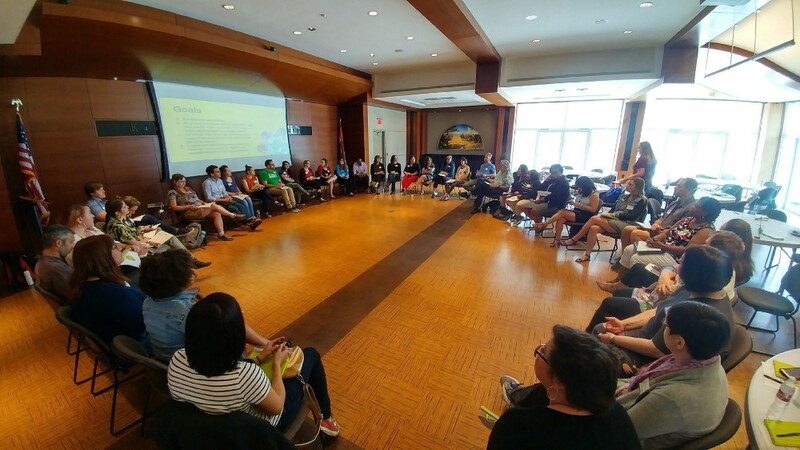 The majority of the first day was focused on discussing the learning circle model itself, sharing experiences, outcomes and challenges of running learning circles in their communities, and also spending time co-creating useful learning circle resources. It was a very full day! Participants made dinner plans on their own and many met up at a local bar later that night. 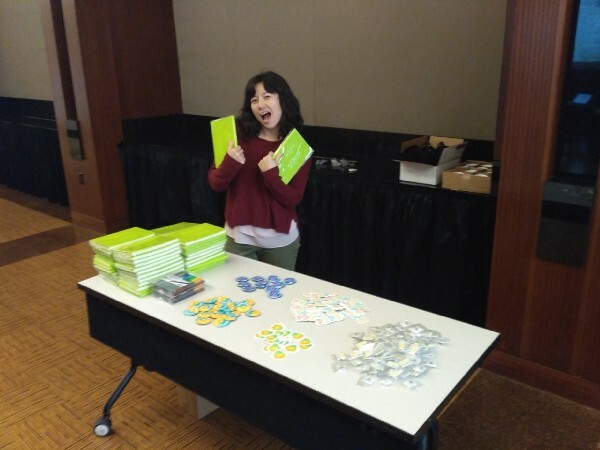 Sharon shows off our stylish notebooks! You can grab your own cool swag through the P2PU Shop. The final day, Friday, May 18th, was directed towards learning about P2PU, the organization, and creating local action plans. In the morning, we created an “open space” to ensure that participants’ interests and challenges were addressed collectively. We closed our event with a in a large circle, allowing each participant to share their next steps following our event. For those who still had time, Kansas City librarians offered a super cool tour of their main branch. Learning Circle Scenario Activity: What is a learning circle, exactly? Our guests reviewed 15 real-life learning circle scenarios in groups, and through discussion, came up with their own definition of a learning circle. It was clear that this exercise was very useful for understanding the core values that are implicit in the learning circle model, and also made us all think about what a learning circle could look like in different contexts. Sharing Experiences: Participants told us how important it was to hear other people’s experiences of and approaches to running learning circles. It was also very beneficial for others to hear that someone else faced the exact same challenges and frustrations when trying to organize a learning circle. We captured as many of these experiences and best practices as possible by filming interviews with our guests and posting these videos on youtube. Breakout sessions: We made room in our agenda for open space breakout sessions that were chosen and directed by the guests themselves. For the Gathering to be most useful for our guests, as with a learning circle, it was important that our meeting be directed by the group’s interests and individual goals. Through the breakout sessions, small groups were able to discuss specific and immediately useful topics such as team coordination, learning circles for GED, and customizing online courses. DIY Photo Booth: Made with Raspberry Pi and a cardboard box! Everyone who joined the Gathering created an action plan for their community and organization. Some focused their plans on creating large-scale training events for their teams, while others focused on offering outreach and support to specific local community groups.We’ll be checking back with each library and community center in the months to come to see how they are achieving their plans and how best we can collectively support each other. All in all, it was a major success, validation for our collective effort, and a significant moment for our ever growing community of learners and educators. Read Masha Malcolm’s blog who attended our Gathering representing San Jose Public Library. Read a detailed summary of our Gathering from Partners Bridging the Digital Divide.